Nestled within the lush coastal hills in the town of Calheta in Madeira, Moradia Sorbus is a beautifully-restored holiday home that enjoys both sea and country views. Nestled within the lush coastal hills in the town of Calheta in Madeira, Moradia Sorbus is a beautifully-restored holiday home that enjoys both sea and country views. This charming villa was once a traditional cottage and wine press, with the completed renovation retaining many original features. Characterful and spacious, Moradia Sorbus is a lovely place to relax and spend quality time with the family. There's a warm and welcoming feel throughout - and the outside space is just as impressive, with a picturesque country garden and range of facilities to enjoy. Taking up the entire ground floor is the air-conditioned, open-plan living space. It offers direct access out onto a lovely terrace, which features a small herb garden for your own use and steps down into the main garden. You can really appreciate just how glorious the surrounding scenery is from the terrace, with clear views of the hillside and sea. Sharing the living space are two separate lounge areas, which both have comfortable sofas and a television. There's also a dining table and a modern kitchen with every appliance you could need. By the kitchen is where you find one of the villa's most stunning features – the original wood stove and oven. The three air-conditioned and ensuite bedrooms are located on the first floor and all boast idyllic sea views. One bedroom features a king-size bed, the second has a double bed, and there are two single beds in the third bedroom. On the lower-ground floor and part of the outside space is where you'll find the restored wine press - which is certainly a talking point! There's also a covered barbecue area with traditional built-in barbecue, outdoor kitchen and a laundry room next door. A choice of seating areas means getting to enjoy plenty of family al fresco meals during your stay. The walled garden features an immaculate lawn and a kitchen garden with vegetables and fruit, which you are free to use. A decked terrace is home to a large, private swimming pool and a selection of sun loungers for soaking up both the views and the peaceful atmosphere. 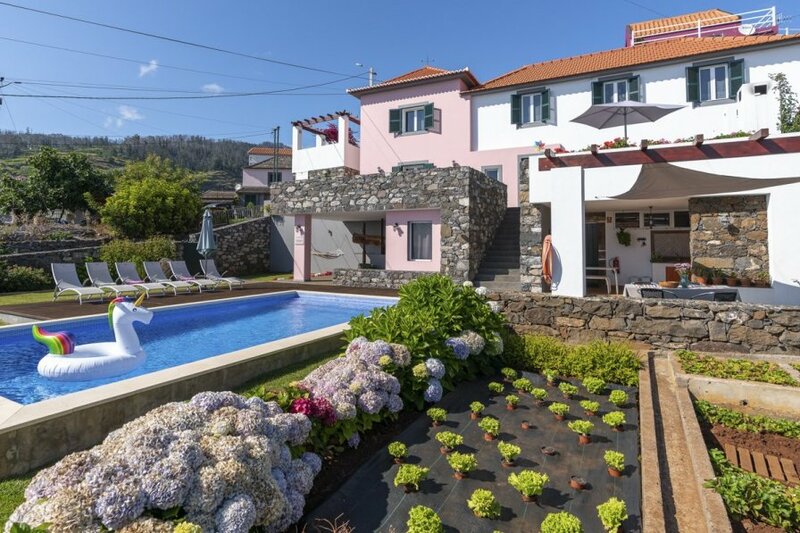 Moradia Sorbus is a stunning 3-bedroom villa near Calheta. Guests will be spoilt as the villa's garden space is lush and even includes a fruit & vegetable and herb patch. One service that you really couldn't get much closer to at Moradia Sorbus is the bread delivery van that passes by the villa every day. Within a 10-minute walk or a few minutes' drive are a couple of cafes, a mini-market, some restaurants, a pharmacy and a petrol station. You can be enjoying the coast in less than 10 minutes after driving down the hill into the heart of Calheta. Here you'll find one of Madeira's few sandy beaches, which features sand brought in from Morocco. The sea is generally pretty calm, making it safe for enjoying a swim and also ideal for watersports such as windsurfing and canoeing. The marina is where you can set off on dolphin and whale-watching boat trips and enjoy a delicious meal at a waterfront restaurant. A little further down the coast is Casa das Mundas, a museum that showcases a range of Portuguese contemporary art. Its sits upon a clifftop, so even the sea views are impressive. There's a cafe serving drinks and refreshments for taking breaks in between admiring all the art. Engenho da Calheta is a working sugar factory where you can see how Madeira rum is made and is definitely one of the must-visits of the town. Around a 40-minute drive from the villa is Madeira's capital, Funchal. This cosmopolitan city is packed with things to see and do. One of the best things to do is take the cable car up the mountain for fantastic views and access to a beautiful botanical garden. The old town is also not to be missed, with numerous cobbled streets lined with historic buildings.